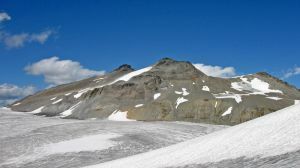 The Glacier Pikes are two rocky points at the south end of the Sentinel Glacier and on the northeast side of the Warren Glacier, which is part of the Garibaldi Neve. The ascent is most commonly done as an easy scramble from the west. The last bit near the top is a walk. These peaks are often climbed as part of a Garibaldi Neve traverse, or they can be climbed from the glaciology huts at Sentinel Bay.